A firm but but­tery white fish; light­ly seared and topped with our sig­na­ture gin­ger tata­ki sauce, sauteed gar­lic chips and green onions. 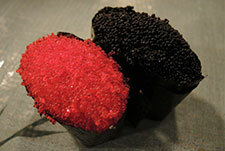 Smoky, salty, and crunchy fish eggs burst on your tongue. Con­sid­er adding a quail egg ($1.00) as a great way to counter the salti­ness. 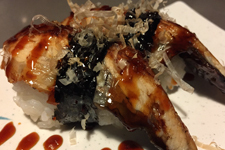 Grilled and sweet glazed, topped with boni­to and sweet eel sauce. 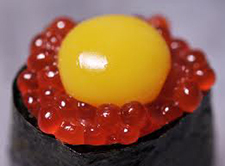 Less salty than fly­ing fish roe, these large, but­tery and mel­low eggs burst on your tongue. 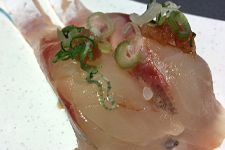 Con­sid­er adding a quail egg ($1.00) as the per­fect fla­vor match. 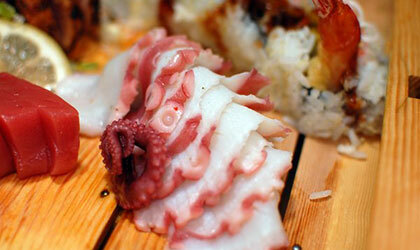 Boiled and sea­soned, octo­pus has a nice bite with a slight sweet and salty taste.